Loreto Riveiro Álvarez (b. Galicia, 1971) graduated in English Philology from the University of Santiago de Compostela in 1996 and completed a post-graduate course on Translation and Technologies at the Universitat Oberta de Catalunya. She has been a teacher and currently works as a freelance translator and as a technical translator/interpreter for a company in the chemical industry. Together with F. R. Lavandeira, she has translated poems by a number of American women writers into Spanish and Galician: Wanda Phipps, Denise Duhamel, Terri Carrión and Beth Ann Fenelly (Barbantia magazine, November 2008). With F. R. Lavandeira, she has also taken part in an International Translation Seminar (Auliga-Universidad Nacional de Educación a Distancia), when they first presented their translations into Galician of a selection of poems by Richard Berengarten. 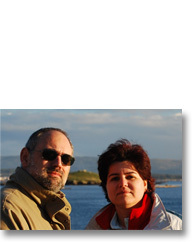 They are currently working on several projects involving poetry translation into Galician. F. R. Lavandeira (b. Galicia, 1966) graduated in Social Education from the University of Santiago de Compostela and did post-graduate studies in Social and Cultural Programming through the National University for Distance Education and the Pontifical University of Salamanca. He currently works as Cultural Manager in the Municipal Government of Rianxo (La Coruña) and as a member of the Social Pedagogy and Environmental Education team at the University of Santiago de Compostela. His poetry collections in Galician include: Mar que evita o meu regreso [Sea that Prevents My Return] (2000) and Tempo é de que se saiban [It’s Time They Knew] (2006). Arising out of a residency at DePaul University, Chicago, his trilingual selection Poemas [Poems] was published in 2007, tr. Mark Johnston and Bernardo Navia. His work has also appeared in the following: Voces na material [Material Voices] (2006); a bibliophiles’ edition of 37 poemas por man propia [37 Poems by My Own Hand] (2006); Voces Na Guerra [Voices in War] (2006); and A cor do soños [The Colour of Dreams] (2007). He writes for the newspaper La Voz de Galicia and for magazines including Leña Verde, Infoxove, 63channels.com, and Anuario Barbantia. In 2008, he gave readings at the International Translation Seminar 2008 (Auliga-Universidad Nacional de Educación a Distancia) when he presented the first translations of poems by Richard Berengarten in Galician, with Loreto Riveiro, with whom he has also made Spanish and Galician translations of poems by the US authors Wanda Phipps, Denise Duhamel, Terri Carrión and Beth Ann Fenelly (Barbantia magazine, Nov. 2008). He and Loreto Riveiro are currently translating selections of poems by Richard Berengarten and by the aforementioned American poets.